Rainbow mountain + Sibinacocha 4days , the best destination for the most demanding trekkers,that blends , Ausangate and Vinicunca, The Rainbow Mountain (5200M.17060,37 ft.), Sibinacocha (4,873M,15,988Ft) Ausangate(6.372m/20900ft), Rainbow mountain + Sibinacocha 4days , the Andean worldview most important Sacred Mountains since our ancestral times, located in the magical region of Cusco Perú, This beautiful 4 days circuit, takes you around the magical Sibinacocha lagoon, the Sacred Mountains “Vinicunca and Ausangate” and over its three high passes, two of them over 5,100m/16732.28ft. 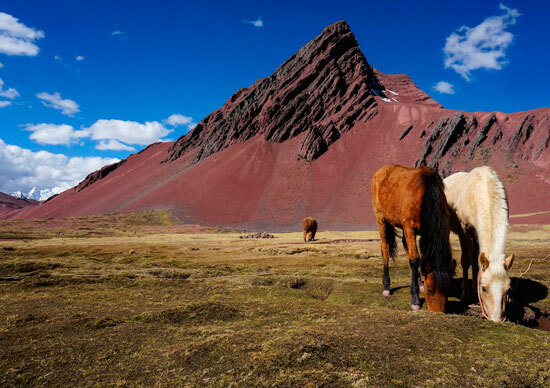 Rainbow mountain + Sibinacocha 4days , begins in Chillca village through the Sibinacocha lagoon, Ausangate mount and ends in the magical Vinicunca. Rainbow mountain + Sibinacocha 4days , this unique and amazing landscape, makes this trek a memorable for a lifetime. Sibinacocha Lagoon (4,873M,15,988Ft) It is ranked as the 22nd highest lake in the world. It is located in the Cusco Region, Canchis Province, Pitumarca District. Ausangate mountain has significance in Incan mythology. 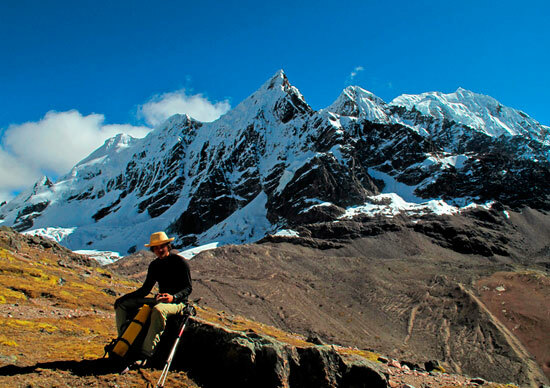 “the road of the Apu Ausangate”, is one of the most renowned treks in Peru. VINICUNCA, The Rainbow Mountain, is listed among the newest and on of the best attractions in the world. Definitely, unique hiking adventures that you will find in Peru. After Machu picchu is the second most popular and a lot less crowded With less people to make your own trip and have the best look on these magical and incredible mountains. The hike alongside the magnificent Snow mountain Ausangate and the arrival to Vinicunca is one of the best experiences and recently known to mankind. You will be picked up from your hotel at 6:00AM transfer to Chillca (head of the trail) we depart from Cusco in our private vehicle. On our journey we bypass Urcos, where we can catch a glimpse of a beautiful lagoon with the matching name, carry on to Checacupe, a farming and cattle raising district where we are left in awe of the area’s fabulous views, Pitumarca(3570M,11712,6Ft), capital of the district with the same name and at long last cross Chillca, a small hamlet that overlooks the stunning Mount Ausangate and Vilcanota mountain range, located 5 hours away from our destination. After a long drive 3 hours, we arrive in Chillca, a bucolic community. Here we will manned by Quechua-speaking Inca descendants and the emergency local horses then have an appetizing first lunch. 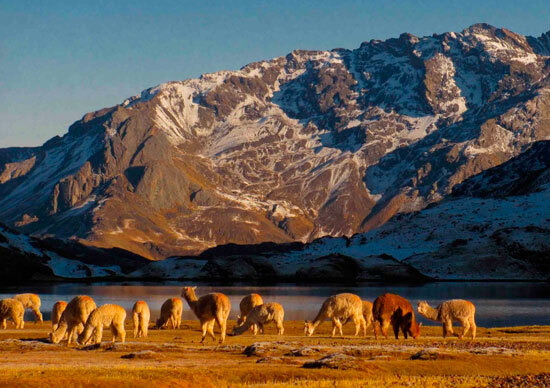 In the day, we continue our hike through a minor climb up the Ajacocha, getting to see llamas and alpacas, and Torreqaqa (view point) a new route off the beaten path, until we arrive at the enigmatic and magic Sibinacocha lagoon(4,873M, 15,988Ft), where we settle down and have dinner. Our camp will be set in a wonderful area with startling views of Ausangate, snow-capped mountains. Sibinacocha possesses a wide bio-diversity. We are likely to spot Andean Coots, “Huallatas” or Andean Geese as well as Andean Ducks from our camp. Camping. Today, we leave early to march along the mountain and peaks for 3h till we reach the Rainbow mountain, We then proceed to move across a pampa where we are likely to spot hundreds of llamas, alpacas and hopefully vicuñas, and then carry on towards Qesiuno where we will eat for the last time on our journey. In this isolated spot, enclosed by remarkable snow-capped peaks such as Ausangate Mountain and populated by small rustic communities, we meet our private convoy that will take us back to Cusco, where we expect to arrive after twilight. IF YOU ARE A GROUP OF 4 PERSON and your interested departure date is not indicated in our departures page then you can choose your departure date on: Mondays, Wednesday and Saturday. IF YOUR INTERESTED departure date is not listed in our page we can open a new group departures and we will try to get 2 more person to validate a group rate. (WE RECOMMEND TO BOOK in advance so we will have the chance to build up a small group and the price will be a group rate.) If we don´t find other interested people we won´t cancel your trip though it will be offered in a private trip with an additional fee. (There are an extra fee for trips with only 2 participants and this trips is operated as a private tour with a private transportation). Note that everyone’s perception of “difficult” or “easy” is relative! ANDES PATH PERU had people complete a trek and say it was easy, while another persons on the very same trek found it to be one of the most challenging (yet rewarding) physical feats they’d ever accomplished. There are many factors that influence your perception, including your overall fitness level and your attitude about traveling and camping in a foreign country. The elevations at which our treks take place add a layer of difficulty in and of themselves. In order to guarantee your reservation we need to receive via www.andespathperu.com “paypal” system, the 40% deposit of the total amount of your tour. The full balance will be due in cash upon arrival to Cusco. Services of expert guides in high mountain trek.